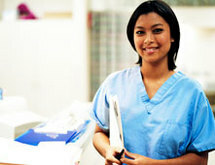 If you are interested in jump starting your career in the healthcare field, you have come to the right place. The Allen School of Health Sciences can put you on your way toward a new and exciting career. You will have access to an unparalleled education led by instructors with real world experience. Take That First Step Toward A Bright & Rewarding Future. We offer a highly specialized educational approach focusing exclusively on creating highly skilled Medical Assistants who enter the field ready to take on a variety of office settings. We have two New York locations in Jamaica/Queens and Brooklyn, as well as our west coast campus located in Phoenix, Arizona. To start the enrollment process, the first thing you need to do is contact the Allen School of Health Sciences. We will work with your schedule to set up a time for an interview and campus tour. During your enrollment evaluation, an Allen School of Health Sciences Admissions representative will ask you about your personal and career goals, prior training experience, career opportunities, class structure, and explain how our curriculum will help you start on the path to a rewarding career. After interviewing with our enrollment advisors, we will suggest a healthcare training path that fits your lifestyle, by exploring our flexible class times and multiple Financial Aid options. We understand that every situation and student is unique. If you have questions about the admissions process at the Allen School of Health Sciences or your eligibility, we are always available to help. Keep in mind that enrollment is limited and timing varies, so we suggest contacting us soon as possible. Investing in your education and future is one of the most important investments you will ever make. That is why we are here to help you with customized financial plans to fit your lifestyle and unique situation. Our goal is for you to make the best choice for yourself and your future. Financial Aid is available to those who qualify including Military Benefit Programs if you are eligible.